Going to online college is quite different than earning your degree on campus. Sure, you can take many of the same classes, work with some of the same professors, and even complete most traditional degree programs online. But still, the experience is pretty different. Well, in spite of our differences, most students — online and on-campus — have two things in common around this time of year: the promise of Thanksgiving Break and the specter of Final Exams shortly thereafter. Taking your classes online neither immunizes you to the giddiness over a long weekend, nor insulates you from exam-related night-terrors. Still, it may seem as if all the homecoming parades, campus parties, and coffee-shop cramming sessions are reserved for traditional colleges students. Well, if you’re an online student, we’ve got something you’ll be super thankful for this year. What follows is a cornucopia stuffed to its wicker capacity with tasty tips and special recipes for the online college student’s perfect Thanksgiving break, as well as tons of resources to get you through that last month of the semester. Otherwise, read on and stuff yourself with amazing tips portioned out just for online students. Ok. That was my last corny Thanksgiving pun. No wait . . . that was the last one. Ok, now that that’s out of my system . . . I know I say this every year, but I love Thanksgiving. I love the wooly sweaters, the seasonally-themed sitcom episodes, and the first hint of chimney smoke in the air. I love how it’s a Thursday pretending to be a Sunday, replete with feasting, football games, and a feeling of contented, well-earned, post-meal laziness. I love the purplish sunsets, the evening chill, the impending crackle of winter, the way those four days span like a candied, carved, and cranberried bridge into the whole-hog holiday season. Ok, that aside, if you’re a student with four days off, you have at least that to be grateful for. And, not to be a drag, but you also probably have a pretty serious load of work between this long weekend and the next big holiday break. Winter is coming . . . which obviously means Final Exams are coming too. That makes Thanksgiving somewhat bittersweet. (Although if bittersweet is the taste you’re getting right now, your gravy has turned. Throw it away and move on with your life). This holiday is a sumptuous engagement of the senses, followed directly by a swift kick from reality, right in the nethers. (Is it just me, or is the Monday after Thanksgiving always the coldest and darkest morning?) Anyway, no need to go there just yet. I only bring it up because the tips that follow balance between the importance of having a great Thanksgiving and the necessity of mentally preparing for the last big leg of your semester-long marathon. As with traditional school, a full semester in online college or grad school can be a grind. It’s important to take your time off seriously. Recharge, both physically and emotionally. That big holiday meal isn’t just delicious. It’s also probably the heartiest thing you’ve had to eat all semester. Be honest. You eat far too many meals while in-class. Your laptop is as much pop-tart crumbs as keyboard at this point. Pull yourself away. Have a meal (and then a bunch of awesome leftover-turkey sessions) while sitting face to face with friends and family, as opposed to online libraries and lecture videos. Or eat while watching a parade, or a football game, or even while relaxing with a crossword puzzle. The important thing is that you take a reprieve from your work and your daily routine. Give yourself this time to be replenished. If you’re working your way through online college (or online high school) right now, you’re dealing with the usual challenges most students face, like exams, deadlines, and grades. But you also face a set of challenges unique to online education. Working on your own terms and from the venue of your choice is awesome, but succeeding this way can also require some adjustments. Make sure you’re doing all you can to capitalize on your opportunities as an online student by checking out these tips. Some are tailor-made for your online experience, and others are pretty useful no matter how you attend your classes. If you need more than just tips, check out some of our expansive resources. We do our best to cover every dimension of the online student experience, from choosing the best online college to paying for your education; from selecting the right major to turning that major into a career. Dig in to our resources. Don’t worry. They’re big but easy to navigate. Our goal is to simplify the process while offering you as much current information as we can. Consider these various resources as roadmaps for your journey through online college. For some of you, online college is more than just a convenient and flexible way to study. For some, it’s the only way. 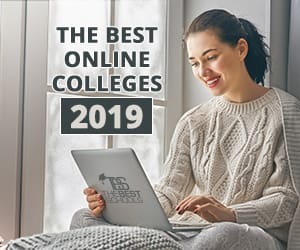 Whether you’re remotely stationed on a military assignment or balancing your online degree with the responsibilities of parenting; whether you’re working to advance your credentials without taking time off from work or you’re managing a disability that makes travel difficult, online college can be an amazing portal to opportunity. Check out our tips for unique student demographics and make sure you’re getting the most out of your online degree program. If you’re considering entering into an online degree program, or jumping from your current program to the next level, find out more about the types of degrees, the courses of study, and the career opportunities connected to each online degree level. Read on and decide just how far you’d like to take your online education. And if you’re just beginning your online college journey, we’ve got a couple good starting points for you. Check out some of our juiciest ranking lists and find the best school for you!